The hotel is located in a very good place. It's close to the Old Town and the Castle. There are many restaurants and cafe. Regarding hotel it self, clean rooms with Ibis standard. The breakfast is good, but not varied. There is parking. Everything fulfilled but nothing beyond basics. Staff were helpful, rooms were clean and fit for purpose. Shower did not drain properly. As said in title everything was fine but nothing above basics. For the price it was an excellent stay including its location. Room was clean. Fairly small, but large enough for us and in line with pricing. Bathroom facilities were good. Limited electrical outlets in the room, however we managed. Only real negative was that our room was next to the tram line and this was very noisy early in the morning. The windows did not offer much in the way of soundproofing. I will not spend time in describing the hotel condition which, I believe, is very well known to you as some construction/ renovation seems to be taking place. I will however share the most unpleasant experience I had upon checking out. As I was checking out the FO lady informed me that I had to settle two parking slots for the night as the way I parked prevented a Gold Member Guest to park his vehicle next to mine. I have explained the reason for me to park the way I did was motivated by the amount of construction materials being stored and obviously moved in and out (ref. amount and shape of the dirt on the floor) next to the parking slot I used. As I refused to settle this abusive charge, this inexperienced employee called her manager on the phone who, in turn, seemed to approve her decision. Discussions and arguments continued for approximately 15-20 minutes leading to threats from your employee to sequester my vehicle and force me to travel to Vienna by taxi or bus shuttle service. After much too long of discussions, that same employee finally informed me that &quot;she didn't care&quot; as she had a credit card pre-authorization and the she would charge me for two parking slots. I we agreed to disagree I have informed this employee that I would ease her job by filling myself a formal complaint about her behavior and the communication gaps that led to this most rude and unpleasant situation. I came back from my meeting and parked my car at around 18:30, went out for dinner around 19:15 and came back to my room at approximately 21:15. The personnel had access to my name, my room number, my email, my personal phone number and plenty of time to inform me about the issue but instead, they elected to take photos of my vehicle and use a template letter that they put on my windshield instead of reaching out directly to me. I have been traveling all over the world for the past 22 years and spend over six month per year in hotels. The incompetence of the front office personnel supported by her Manager or supervisor has brought the light on some very serious training and processes issues at your hotel and left me with a very bitter taste that I have reported to my company as well as Carlson Wagonlit our corporate service provider. Poor accommodation, outdated. Bathroom becomes swimming pool after shower. Where did you find this personnel? Completely unsuitable in hospitality business. Excellent location though, 5 minutes walk to historical city centre. Comfortable and clean hotel at Bratislava's city center. The hotel is situated at a central location and you can reach old town in 5 minutes on foot. The beds were very comfortable. The breakfast was delicious. The staff was kind, helpful and friendly. I would preferred the room to have 2 face towels and 1 garbage bin. Modern, clean and great location. Helpful and friendly staff. This is a great option for staying in Bratislava. A quiet comfortable room in a great location. Reception is pleasant with helpful staff. Breakfast is adequate, but no bacon! 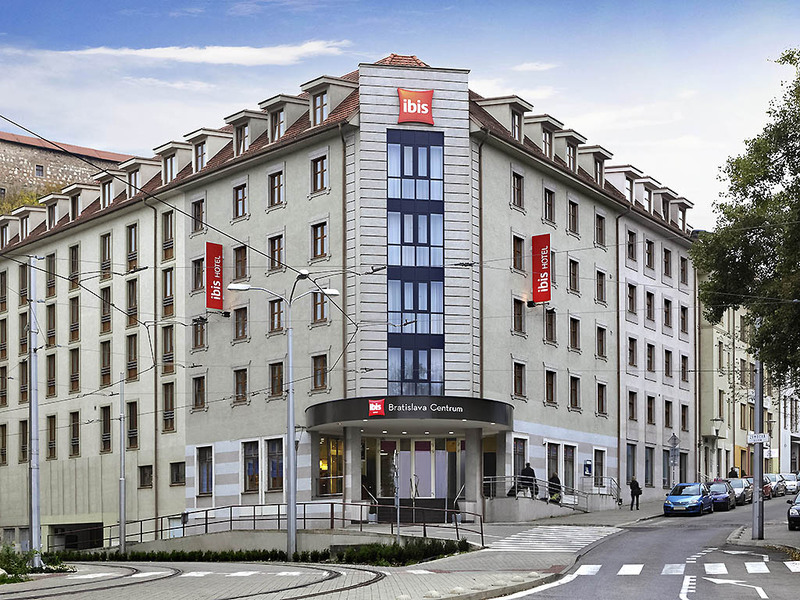 Ibis Bratislava is located in a ideal part of the city and is a mere 10 min walk to the city centre. Lovely friendly staff (especially Ivanna) who made very effort to make our 3 day stay enjoyable. The room itself was super clean and the bed was very comfortable, adequate shower and good wifi. The only negative things I can think to comment on, is that the TV only had limited channels, not that it made any difference to us as we did not come to Bratislava to watch the TV. Staff were welcoming and helpful. Room was clean and quiet, bed comfortable - got a really good nights sleep. Great location and price. Only criticism would be no tea/coffee facilities in the room and tv channels very limited. However free WiFi and can get lovely fresh coffee from reception and takeaway available so not a problem. Would definitely stay again and recommend. Pleasant and welcoming short stay. Our 2 night stay started with a pleasant welcome from the front desk person who was very helpful with the information requested. The room was clean and the bed and pillows to our liking. Wifi was satisfactory. Breakfast well served and abundant for choice. I chose this hotel because it is a 8 to 10 minute walk from Most SNP bus terminus and same distance to the old city centre. Some noises from the tram railway are not the fault of the hotel. Although hotel staff was very nice and helpfull, the hotel facility isn't great. The tramways rumbling under your windows early in the morning won't let you sleep well. Also, cleanliness of bathroom could improve. Breakfast was okay, so as access to the garage. It was our first time in Bratislava and it was a surprise birthday trip for my boyfriend. I looked for a quality hotel which was close to the city centre and I cand acriss ibis. I had heard of the name before and but never anything bad so thought we’d try it. It was pretty much everything I was after. A slight disappointment was that the TV didn’t unfortunately work but because we were out most of the time, we weren’t really using it. Couldn’t fault the rooms or the service provided from the staff. Maybe having a kettle with tea & coffee in the room would of topped it off but not a major thing. Only complaint we had was that breakfast was expensive (€9.50 pp) for what it was & we didn’t enjoy it as there was no bacon after specifically asking the night before if there was bacon to be told that there is and the hot food was all mushy and uneditable as it was on the cold side - which resulted in us leaving it and paying for a full English breakfast elsewhere on top of already paying quite a bit for breakfast at the hotel. Channels on TV are local and quality of video is worst of all. It is not viewable and hence the entertainment in this hotel is next to zero. Toiletries are not provided in bathroom. If asked for the same, have been informed that these are chargeable items. Housekeeping used to come only when they have time and not when necessary. Bed-sheets are not changed on a daily basis. When brought this to attention of the housekeeping personnel, they immediately changed but didn't repeat the same on the very next day. There are no enough umbrellas available for hotel. Spread of food in breakfast is very limited and no change in the variety of food. Breakfast is not part of your room package. Wi-Fi is an open connection and not password protected. Connecting to this network is big issue considering the multiple hack events made by hackers when trying to operate on laptop. Not a pleasant stay at all considering that i was put-up for 16 calendar days and had to go through all of this for 16 days. I had several rooms booked for a group vacation but a few rooms had awful trouble sleeping with the noise from the tram lines by the hotel which ran all night.